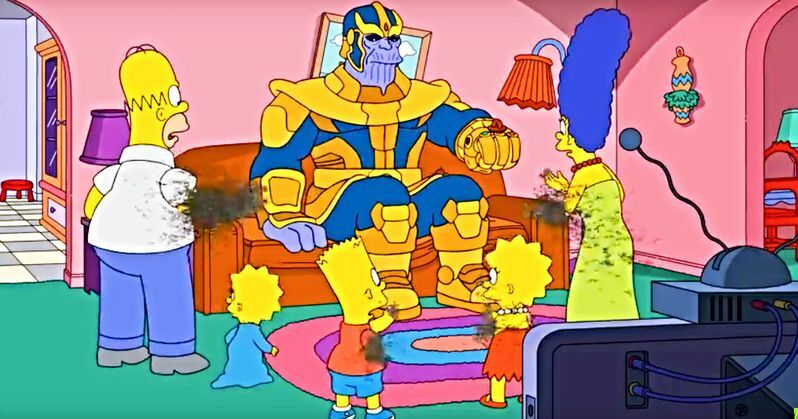 Thanos took a visit to Springfield in the latest couch gag on The Simpsons. Fox's long-running animated sitcom is currently in the middle of celebrating its landmark 30th season, which kicked off last fall. Over the years a lot has changed, but we still get a new couch gag every week and it's impressive how creative those working on the show can still manage to be after all these years. Case in point, they brought one of the most iconic villains in the history of the Marvel universe into the fold for their latest episode for a pretty memorable opening. The sequence sees the Simpson family approaching their couch, as per usual. Only this time around, the Mad Titan has already made himself at home. Once they approach, instead of popping the final Infinity Stone into his Gauntlet, Thanos makes use of Maggie's pacifier and, just as he did with many Marvel heroes at the end of Avengers: Infinity War, he dusts Homer, Marge, Bart and Lisa. Only Maggie remains, and she takes her place happily alongside Thanos on the couch. This oddly serves as a bit of foreshadowing when it comes to the future. That's not to say that Homer and the gang are actually going to meet a grim fate, but it's about the pending merger of Fox with Disney. In the coming months, Disney is expected to complete their purchase of the majority of Fox's media assets, which means that The Simpsons will ultimately be under the control of the Mouse House. As it just so happens, Disney also owns Marvel. So, Thanos joining The Simpsons this week, in a strange way, is prophetic. That's not to say that the merger is all bad. It could provide all sorts of creative crossover opportunities like this in the future. But there is a dark side to all of this. Many Fox employees are going to lose their jobs and one of the major movie studios, 20th Century Fox, will be absorbed into what is already the biggest movie studio in Hollywood. So, in as much as Marvel fans are excited about getting the X-Men and Fantastic Four possibly rebooted in proper fashion, the dark side of Thanos dusting some of Springfield's most famous residents does ring true a little bit when it comes to the future. The Simpsons has faced some controversy in recent years, thanks to growing pressure to change, or at least properly address, the character of Apu. Despite that, the series is showing no signs of slowing down and will continue to press on, even after more than 650 episodes, making it the longest-running scripted series in the history of American television. That is, unless Disney comes in and decides enough is enough. The Simpsons season 30 continues Sundays on Fox. Be sure to check out the Thanos couch gag from the Animation on Fox YouTube channel below.